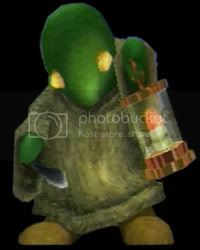 The Tonberry Species is a race of nearly omnipotent beings whose main task in life seems to be observation. Nearly nothing is known about Tonberry biology. They stand approximately two feet tall, with smooth green skin and yellow eyes. Their eyes change color according to their mood. They have been known to live for many millions of years. The Tonberry race is governed by the Tonberry King, who acts as a hub for a group consciousness. When one Tonberry sees or learns something, the information is immediately transmitted to the King, and then to all other Tonberrys, making communication almost obsolete. Tonberrys have been known to "Sing", a sound generated by air sacs in their skin, combined with empathic energy. These sounds can convey a multitude of emotions and messages, from lonliness to rage. These Songs are sometimes used for interstellar and even interdimensional communication. When Tonberrys "argue" over long distances, star systems caught in between have been known to be destroyed by the sheer power of the transmissions. Tonberrys can be one of the most lethal forces in existance. A singular Tonberry is capable of defeating almost any foe singlehandedly. A group of them are nigh invincible. The Tonberrys have been around for trillions of years, and their exact origins are not known. Tonberrys have taken Observation and Remembrance as their primary purpose in life. As such, there has been a Tonberry present at most major events in most civilizations histories. These Observers keep out of the way, and are under standing orders to Observe only, never to interfere. Tonberrys are an asexual species. All Tonberrys are referred to as "it". Tonberry reproduction is rare and the exact specifics of the act are not known.